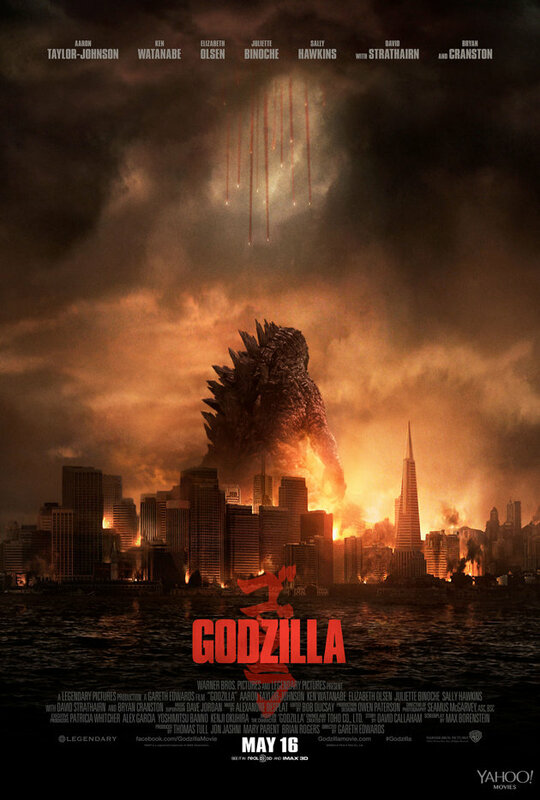 GODZILLA (2014) Review – SKREEONK! GODZILLA opens with a great credits cinematic accompanied by one of Alexandre Desplat’s best pieces of composition from the film. The tone is immediately set, and the audience is informed that this is not going to be a lighthearted venture. The bombastic, old school score and mash-up of vintage sepia toned atomic explosion footage is oddly similar to the opening of Tristar’s 1998 attempt at the same – but thankfully the similarities end there. Edwards and Co. did it right, and the film that follows does right by the genre in a way that few films have. I don’t want to sit here and bore you all with a recap of the plot, so lets just discuss what works and what doesn’t, yes? For me, this movie is very Spielberg. Thats probably the eleven-thousandth time you’ve read that online now, but its 100% true. If I were to pick a film to compare this one to, it’d be Jurassic Park – and not in the ‘sad ripoff of sequences’ way of the 1998 film, but in spirit and tonality. The way Edwards and his cinematographer Seamus McGarvey choose to frame their shots is very reminiscent of that classic Spielberg film – from the opening sweep of tropical mountains and cramped group character shots, to the rainy car windows as a lumbering Godzilla approaches the Golden Gate Bridge, I found the creative team taking a lot of cues from JP’s playbook. Not only is there a large visual influence from this film (and many others of Spielberg’s, such as Jaws and Close Encounters), but I feel it in the characters and script as well. This story’s version of Dr. Serizawa (played by the wonderful Ken Watanabe) and his colleague (Sally Hawkins) are very Dr. Grant and Dr. Saddler to me, especially in their wide-eyed wonder and almost worship of Godzilla. Yet as much as the influence can be felt in the aforementioned elements – it truly comes through in the plot. Edwards, Dave Callahan (story) and ‘final’ script writer Max Borenstein are class A teases. If there is one thing about this film that every review will address, its this. The film they’ve decided to give us isn’t unbearably trigger happy like Man of Steel, another recent reboot for a beyond-iconic character like Godzilla. It isn’t flashy and packed to the brim with giant monster action like Hollywood’s last kaiju epic, Pacific Rim. Its a thriller – an old school monster film wrapped in the guise of modern Hollywood. This, however, seems to be whats angering a lot of the fanboys and general public. Hollywood has trained modern audiences to be impatient, to be given everything up front. Restraint isn’t something exercised in modern movies, and for the most part people don’t want a film to hold back. And that doesn’t make either style of film making right or wrong, it just serves to make the composition rather dividing. These types of film aren’t for everyone, and that is completely fine – everyone has their own opinion. What doesn’t work, though, is calling this structuring a departure from Godzilla – because its not. Think back to the original, the sole influence for this film. Godzilla is, pretty much beat for beat, revealed and featured in the exact same way for the exact same amount of screentime. Sure, this go-around he’s kicking the teeth out of a few other beasts, but the original film (and many that followed later in the series) exercised restraint with Godzilla. He wasn’t always the focus of the film, but more a be-all-end-all that would enter and set things straight at the last moment. Hell, even Godzilla vs Megalon used this tactic. Even if this weren’t the case, every ten minutes that Godzilla isnt featured for the first half, the M.U.T.O’s are. The way people are complaining about the “teasing” in this film you’d think there was absolutely no monster action until the climax – which is completely false. We’re treated to a ton of excellently shot Muto destruction scenes building up to the big fight, all of which resulted in me being won over by two new kaiju that I was not fond of before I saw the film. Thats what gets me, though. Legendary’s GODZILLA manages to celebrate many elements of the 60 year franchise.We are given raucous kaiju rumbles between multiple monsters, a Godzilla who is not only a force of nature but seen as the ‘good guy’ by humans at the end of the film, and looming notions of nuclear destruction and the costs that come along with it. Each of these elements are from very different periods of time within an extremely diverse franchise – yet Edwards and Co. managed to work them all into one cohesive film. However, the complete film itself ends up in the aforementioned category of ‘restrained’ Godzilla films. Many people were anticipating a film from the opposite category – frenzy-esque, kaiju-action heavy movies like Godzilla: Final Wars and the Heisei series from the 90’s. This is what we got in our first taste of a Hollywood kaiju film, Pacific Rim. For some fans, these films aren’t exactly where you’d go for influence if you’re looking to reboot the franchise, and I am wholeheartedly in that camp. The film that Legendary gave us draws from the classic monster movies of the series like Gojira, King Kong vs Godzilla, Rodan, and The Return of Godzilla. Some seemed to be left disappointed by this, but I honestly think we’re all better for it. Godzilla shows up early on, and is discussed in every beat of the film. We aren’t left without his character for the first hour, as many people are complaining. 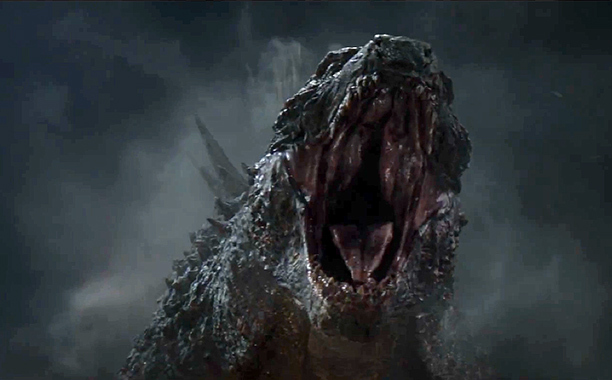 Godzilla’s first full reveal is well before the halfway point, and we’re made aware of his presence in many creative ways throughout the plot. Perhaps now that we’ve been treated to this sort of structure for his new origin story, there will be more room in a sequel to revisit the stylings of more kaiju-centric entries. Edwards has said he’s a huge fan of Destroy All Monsters, so we’ll see. With all of that said, the suspense and foreplay of this film works for me, but also presents the film’s biggest flaw. Such a structure can only surprise you once – and that’s the first time you see it. After that, the suspense is no longer in place – you know whats going to happen from then on. What we’re left with is a film that will, from your second viewing forward, drag through the first hour and a half and prompt most to wish they could just press the fast forward button and get to the good stuff. I really dig the old school vibe and sense of anticipation, but what happens when that is no longer a part of your viewing experience? Is everything that comes before the film’s climax strong enough to warrant multiple viewings? Yes and no. Desplat’s score drives this movie forward in a way I wasn’t expecting. I believe the word I used before to describe a piece of his, Bombastic, is about as good a word as any to convey what he brings to the film. His composition is loud, brave, and unique to films today. I absolutely adore his work for this flic – my only complaint being that Godzilla could have used a bit more of an actual theme, a hook we could all hum afterward. So for me, thats a yes. The Mutos are now a yes for me, too. I wasn’t fond of their angular designs beforehand, but having seen the film several times now I really enjoyed them all fleshed out. Their sound design was especially well executed – all of their unique squawks and clicks served to really make them stand out amongst Godzilla’s established rogues gallery. I also appreciated the presence of the white highlights on their hide. This really helped them pop, something I hadn’t seen in any of their figures or glimpses of their designs before the film’s release. Watanabe’s Serizawa is fascinating to me, and having him in a Godzilla film is a dream come true – so thats a yes as well, as are all of his little nuggets of G-history peppered throughout the film’s buildup. 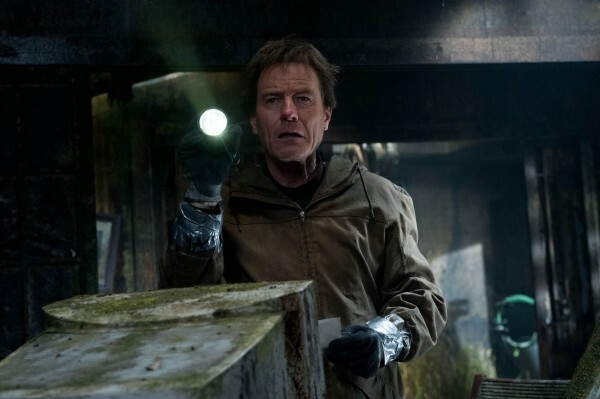 Bryan Cranston’s Joe Brody is a yes (of course) – easily the films most interesting and fully fleshed out character. But we lose him thirty minutes in, which to me is the film’s only glaring misstep. Joe should have been the main character of this film, period. He had the most backstory, and the most interesting role going forward in the film. Everything from his personal losses to his life’s work tied him directly to the plot and the Big G… and he dies prematurely. Prematurely even feels like an understatement, especially when you consider who we’re left with in his absence. 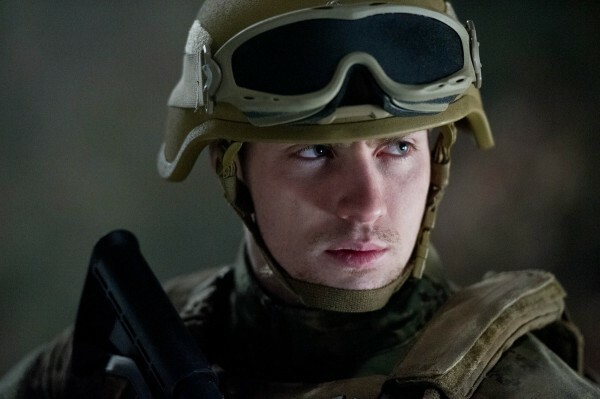 A lot has been said about Aaron Taylor-Johnson’s role in this movie, and he doesn’t deserve all the hate. Ford is written as a very one-note character, which is unfortunate for Taylor-Johnson. I think he does a fine job, but I also think he was miscast. We needed someone equally as interesting in that role as Cranston, who severely overshadows his son in this film. The role needed to be filled by someone as unique and gripping as Cranston, someone who could turn the one-note role into a character that draws us in and makes us care. So in that respect, Joe’s arc and the resulting ride with his son Ford is a “no” for the film. Surprisingly, Elizabeth Olsen is sort of a ‘no’ for me as well. She isnt given much to do in the film, which is fine. She just didn’t do it for me, oddly enough, because she’s a very talented young actress. With all of this considered, I will be enjoying this movie for years to come. It may not sound that way, but I truly enjoyed all of the set up, all of the creative ways they managed to build a new history and world for Godzilla, and its a new favorite of mine. I’m not sure its enough to tide everyone else over, though. But as always – to each their own! All in all, we win with this film. It could have been oh so very much worse, and it wasn’t. We weren’t even treated to a merely mediocre film, either. We got a good film. 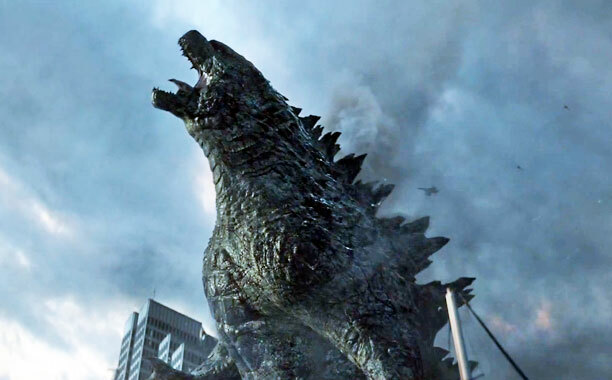 A solid, damn good Godzilla film… One where the climax is filled with incredible CG atomic breath – and the best ‘effing tail slam since GMKGoji whopped Baragon clear across a forest. And for that I believe we all owe Gareth Edwards and team a solid Hell Yes. Final numbers for the weekend show a $100 million dollar opening domestically, and the movie is absolutely raking it in overseas. With a hotly anticipated sequel already confirmed, its hard to believe we’re already here and I’m writing a review after having seen a new Godzilla film for the third time. Let that sink in for a second. 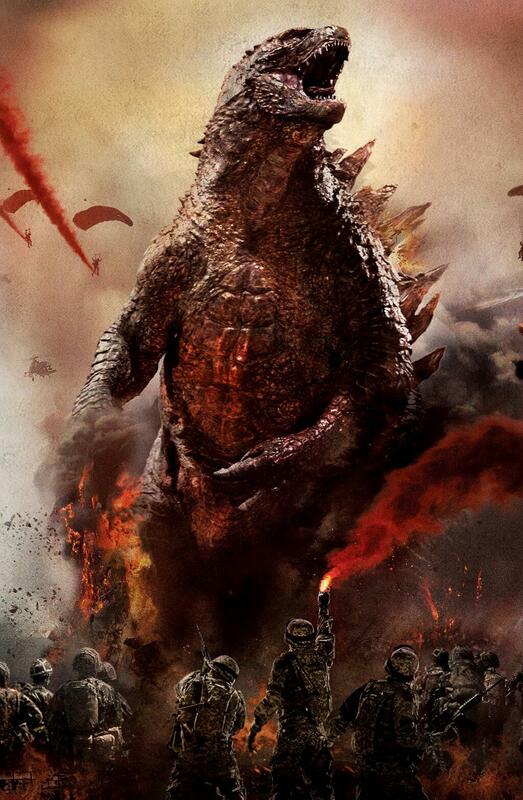 Godzilla is back, and pop culture is embracing him fully. The years to come will give us more Godzilla films, more figures, more blu ray releases, and more celebration of the character than we’ve seen in decades. I’ve loved Godzilla for as long as I can remember, and my childhood memories are filled with VHS tapes of the classic films, and playing with Godzilla toys on a constant basis. Now the rest of the world is in on it. Everyone can appreciate Godzilla now, not just me. Not just us, the fans. That alone is enough to make me very, very happy. I’ve said it a hundred times, and I’m going to say it again. Its a damn good time to be a fan. I’m truly looking forward to what all this rebirth will bring. Hopefully you all are, too. Posted on May 19, 2014 2 By Jon D. B.	Kaiju Movie Reviews! Posted in Kaiju Movie Reviews!, Toho Movie Reviews! Just came back from my second viewing. I agree with just about all of your points, although I enjoyed the second viewing as much as the first. I, like you, felt this movie was more a traditional Godzilla movie than some fans realize. Granted, the characters could have been developed a little more, but to me, some of this is really nitpicking. We FINALLY got a big budget Godzilla movie that was a MAJOR hit. And for that, I am happy. Next Post Which Godzilla Are You!? Previous Post Official Legendary GODZILLA Imax 3D 13×19 Posters Available on the KFM! Limited Supply!